Earlier this week, on May 21st, Adobe announced an agreement to acquire digital commerce Leader Magento for $1.68bn. Adobe focused on how Magento would enable them to close the customer journey loop with consumers. These journeys, often initiated by the digital marketing tools already offered by Adobe, could now be finalised with a digital transaction. This move by Adobe changes the industry landscape, and there are several ways of seeing the acquisition in context. As commerce and in parallel, purchased media are becoming increasingly digital, a comprehensive transition of consumer business models is underway. The customer pull-model is, step by step, replacing the historical push-paradigm built on efficient logistics chains, inventory and category management. The pull-model demands that commerce must transition to a dynamic fulfillment of customer needs as opposed to generating demand by push marketing methods. The success of the pull-model is entirely based on an ability to have a continuous conversation with customers. In Adobe´s terms, this is about continuous omnichannel, analytics-driven customer engagement, with data as the foundation for delivering individualised customer experiences. Establishing a position within digital commerce, allows Adobe to establish more touch points for data collection and application, with a new ability to shape the value of those interactions for the end-customer. The customer transaction experience becomes an integral part of the continuous engagement process, including new aspects such as dynamic pricing and next best offer. The companies with the highest data density, the deepest customer insight and the best ability to leverage this insight to curate and respond to the need of their customers, are the most successful. As companies change the “how” they will also change the “what” and “who with” of commerce. Advanced pull marketing is not about optimising or tailoring your product or inventory to the anticipated needs of the customer – it is far more transformational. A focus on inventory can no longer lead Commerce. The ongoing traditional retail apocalypse is a reminder of the fact that management through the allocation of capital is unlikely to lead success. Instead, high capital returns are the likely consequence of a superior customer engagement strategy and execution. This change in dynamics is profoundly affecting the deployment of media for customer interaction. Google, a part of the pull-model, is no longer the primary starting point for shopping-related product searches. Instead, this activity has shifted to closed domains and within mobile applications, with Amazon the prime example. The current trend is towards an increasing reliance on proprietary media, increasingly guided by first party data and selectively supported by a combination of third-party data sets. Potentially, this trend has huge financial implications for media purchasing. However, it also involves securing a fundamental ability to address customers in an environment where traditional channels have increasingly lost their reach and relevance. Developing ownership and access to that data and the required execution competencies should be a matter of critical urgency for everyone engaged in commerce. As business models are disrupted, it is possible that supporting software architectures, such as ERP and CRM-systems, are also likely to be disrupted. Any architecture that begins with physical assets, a supply chain, capital efficiency metrics, and so on. (all classical key attributes of a “store”) is thus likely to become obsolete. Referencing the current search trend impacting Google, even models that put the product in focus are likely to raise suspicion. This obsolescence is a major question, not only for enterprise technology customers, but also the technology companies themselves. 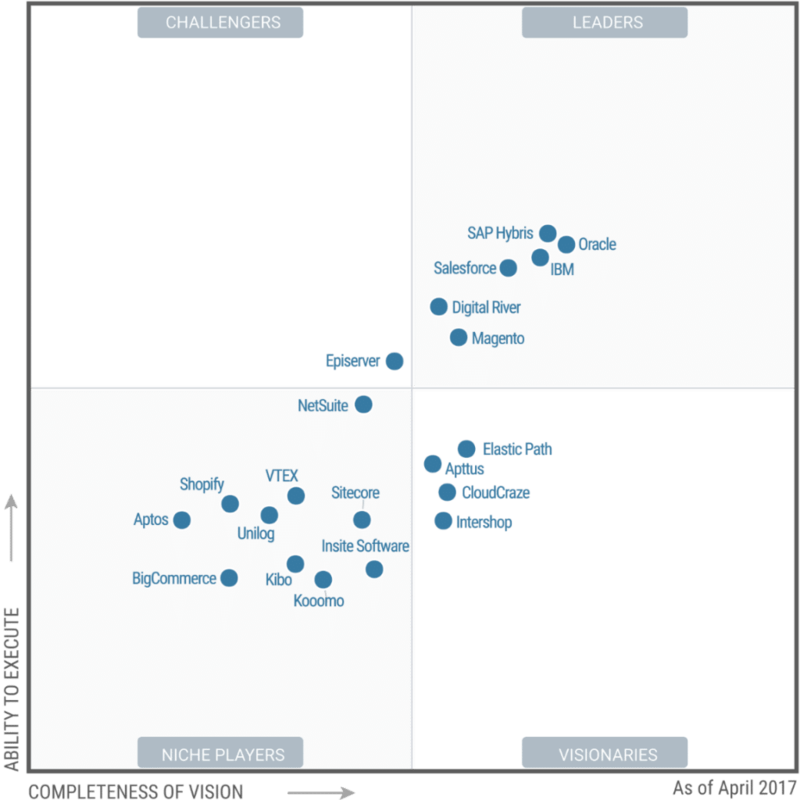 Within the digital commerce space key “Leaders” (see Gartner Magic Quadrant below) include SAP, Oracle, and IBM. They all possess a legacy of an asset-optimisation approach to business. Adobe and Salesforce have less of a legacy burden in this respect. Adobe has a background in digital creative suites and Salesforce in CRM. Significantly, both are today on a converging strategic trajectory by strongly emphasising customer experience management enablement as their ultimate value proposition. On another note, the only major technology brand without a strong position in digital commerce is now Microsoft. Given The MS focus on the enterprise, this is perhaps understandable. Yet given their ambitions in the CRM area, and their aim of developing Dynamics into a fully fledged customer experience management (CXM) system, they are likely to be having the same discussions as occurred recently within Adobe. In their case, companies that have a Microsoft affinity or have already deployed on Microsoft Azure could be the most likely partners for early discussions (e.g. Episerver, Sitecore). Despite the strategic logic, there is still a strong sense that with Magento, Adobe is consolidating in a market that is already of today, not necessarily imagining a new potential business model still years away. In some sense this is a matching action – especially after Salesforce entered digital commerce with their acquisition of Demandware, it must have been a consideration for Adobe to engage in this space as well. Within the context of the Adobe business, there is an interesting and complex situation, that long-term market expansion (as in potential new customers), is becoming more difficult, which puts significant pressure on value expansion, radically increasing share of wallet and/or needing to expand the value of their offering. The scope for value expansion is seen, by Adobe, to be significantly larger in their Experience Cloud (a.k.a. marketing and analytics). Currently, this encompasses data-driven marketing, data management, mobile marketing, customer experiences (customisation), cross-channel marketing and programmatic advertising, to which Magento adds transaction and order management capabilities. However, the paradox is that the Adobe experience cloud business current growth rate is smaller than that of their creative cloud, at roughly 15% vs 25%. Moreover, it is less profitable with a gross margin of ca. 63% vs 95%. One of the consequences of this is that Adobe will likely not only be motivated to develop its presence in the marketing and analytics space through acquisitions but will be compelled to do so, in order to adjust for the organic offset. It is likely that Magento was well captured by this financial logic. There are also two other relevant considerations from Adobe’s perspective. Firstly, the field of likely acquisition candidates has become somewhat limited. If Adobe wanted to acquire a digital commerce Leader, of significant size and without conflicting technology dependencies (e.g. Apttus and CloudCraze are Salesforce-based) there just were not many alternatives. As with all acquisitions, the defensive consideration of losing potential options to competitors is likely to have been in play. Adobe generated a cool $1bn cash flow in just the first quarter of this year, slightly upping the pace on the $3bn of operating cash flow they generated in FY2017. Without buy backs, the company would have soon been closing on $5bn of net cash on the balance sheet. In this context, a $1.6bn cash acquisition that is also strategically sensible and supportive of the business is not much of a stretch. The only insight into the Magento financials is that 2017 revenues were approximately $150mn. That puts the acquisition valuation on a rather punchy multiple of 11x EV/Sales. However, in context, this is still at a material discount to the 15x trailing EV/Sales multiple that Adobe itself enjoys! In conjunction with the Magento acquisition Adobe also announced a new Stock Repurchase programme of $8bn over 4 years (through FY2021). In fact, it was this latter announcement that dominated the headlines and investor attention. From an industry perspective, a somewhat conflicting indication of the tremendous value being generated from digitalising customer engagement combined with the challenge of re-deploying capital into further developing the business. Perhaps this is another tangible reminder to us all, of how capital is no longer the principal factor, or even at times the limiting factor of value generation and growth. Sasu Ristimäki is an independent financial advisor and analyst based in Helsinki, and Kim Weckström is a Partner at Avaus.